Run Panda Run is a brilliant game to play on your Android Phone or Tablet,Your kids will really love this funny panda game and soon you also might get addicted to this game. 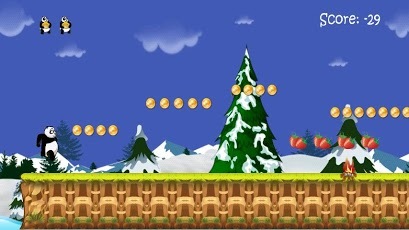 In this your mission is to go as far as possible while many obstacles and power ups await you. The 2D Side Scroller game features some good HD graphics with two themes Adventurous summer forest & Chilly winter theme that add more color to the game. Finally,Run Panda Run is a great game to play if you want to pass some time and try not to look like a professional gamer.